...but it just turns an LED on. I've spent a few hours this afternoon on Baking Pi excercise OK1 for the Raspberry Pi. The OK1 exercise results in an SD card with your own 'operating system' on it. In this case, it just turns on the OK LED on the rpi board, then goes into a busy loop. ;unclear to me if loading this value affects the other pins? ;are we setting all other pins in this bank to input? ;so this is a bitfield? can control many pins at once? His instructions are clear; setting up the mac with the gnu toolchain was quick, and using his template file to create the assembler main.s was straightforward. All that could be done in about 15mins; the other hours I've spent are in trying to understand what's happening, flipping over the reference manual, following up on Wikipedia. Most of that time was spent trying to work out what's going on with the GPIO register; the base address, the offset to target the relevant pin (the one wired to the OK led), the data that gets put into the offset to set it to output mode, then sending the index of the pin to the address for setting pins off (thereby turning the LED on). There's a bit of jumping around between decimal and hex and binary, which is confusing. And because we're dealing with the CPU, the distinction between address and data is not completely clear. That is, the data in this register is the address for that operation, and populating that address with this data actually does something-- changes a pin state, lights an LED. It's so easy to learn things as needed now -- when I was first learning about computers in the 70s, it was pretty impossible. 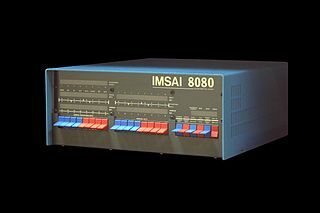 I remember reading about the MITS Altair and the IMSAI 8080 in Popular Electronics in the mid 70s. They were the first hobbyist computers, programmed by flicking switches on the front panel. No long term storage, tiny memory, and I/O limited to buttons and LEDs. From this limited start people would interface with keyboards and screens, write drivers for paper tape or cassette storage, and the basic assemblers and editors to increase capability enough to do the next round of pulling themselves up by their bootstraps. The rpi is a completely different beast of course, with built in USB, HDMI, Ethernet-- many layers of complexity on top of the core CPU; none of which I have a clue how to access. Yet. Now to make the LED blink.